Scanning with your iPhone is almost as quick as taking a photo, and way more useful down the line. Paper is still great for a lot of things. It’s lightweight, it’s fairly water-resistant, and is just about the best tool available for reducing the number of trees in the world. But it doesn’t sync with iCloud, and anything written on it is not searchable. Luckily, there’s an easy way out of this dark age. You can scan all those clipped recipes, and those receipts, all those sheets and scraps you have laying around, and which annoy you until you ned one, at which point it disappears. Today, we’re going to use Readdle’s excellent Scanner Pro to turn your paper into pixels. You may be surprised at just how easy and useful this can be. It looks better. If you’re scanning an actual document, then a scanner app will produce a result as good as using a proper document scanner. It keeps the pictures out of your camera roll. OCR, or Optical Character Recognition. This is the big one. A scanner app will read any words in your picture and turn them into searchable text. If it’s a typed document, then the accuracy is almost perfect, but it can even work on hand-written text. You can scan a whole lot more than just paper scraps and documents, too. Text recognition works on any picture containing text, in theory. 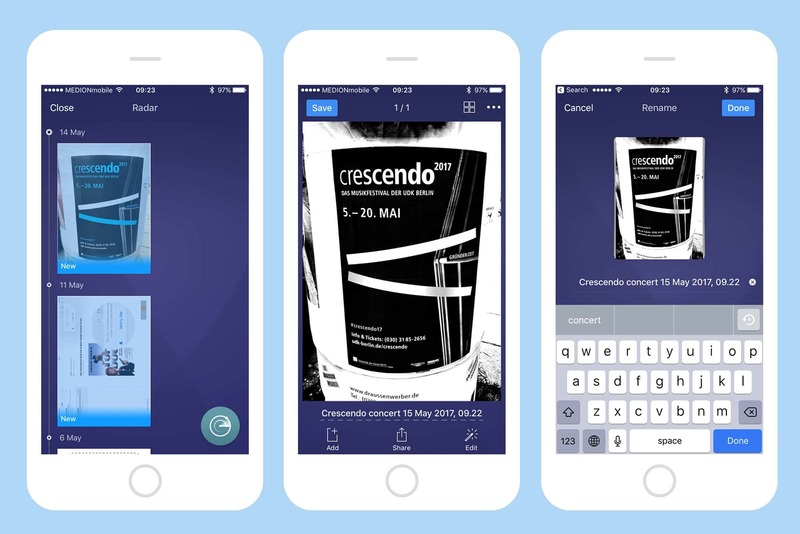 If you see a poster for a concert you want to check out, scan it, and make it searchable. 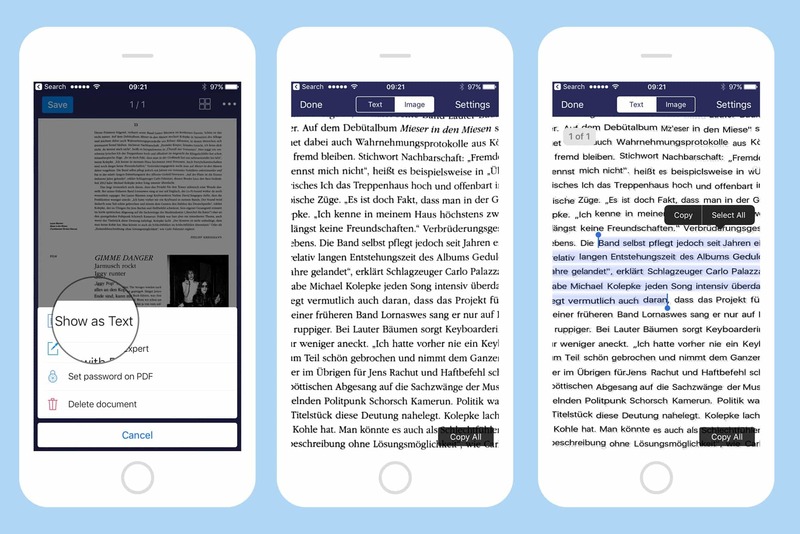 Scan articles from magazines you find in coffee shops, and copy out whole chunks of text later, or highlight passages you like in your PDF reader of choice. Pretty much anything can be scanned. What about the menu hung outside a restaurant? If you scan it instead of just snapping a photo, you will be able to find it in future, even if all you remember is that they had “carpaccio” of tofu among the appetizers. What about the teacher’s blackboard in your evening class? Why write all that stuff down when you can just snap a picture, and see it all in the original context any time you like? Of all the scanner apps I’ve tried, Scanner Pro is my favorite. It’s clean, easy, fast, accurate, and never confuses me. It also has a lot of extra power if you need it, but works as a plain-old scan-and-forget app if that’s all you want. So let’s fire it up and scan a document. Everything is automatic, except adding a caption, and even that is mostly done for you. First, find a bright spot in the room. Kidding! Scanner Pro uses the iPhone’s flash to illuminate the scan, so you can do it anywhere. This may be the only time you want to use a flash to take photo. What you will need is a background that contrasts with the paper you’re scanning, so the app can automatically find the edges of the paper. I picked a magazine, in German, to show off some of Scanner Pro’s other neat tricks. To scan, just 3-D Touch the icon and tap New Scan, or launch the app and hit the big plus symbol. Then point your phone at the document and wait. The app detects the paper’s edges, and when it does it flashes the flash and snaps a pic. Here you can tell it what kind of document you’re scanning (a photo or a document, B&W or color). This only affects the final appearance. If you have multiple pages or sheets, just flip through them, pointing the camera each time. It’s pretty fast. When you’re done, tap the icon at bottom right (the one with a number showing how many pages you’ve scanned). On this screen you can give the document a name. This takes a second and makes a huge difference in future, when trying to find something, so do it. You can also have the names generated automatically (visit the settings). I have it add the date to the name. Now, just hit save. Or you can share the new scan right away. More on that below. Scanned text is turned into editable text automatically. This is the best feature of scanning apps, I think, so you’ll want to switch it on. When I first purchased Scanner Pro, OCR was off by default. If that’s still the case, then you should visit the app’s settings (the cog icon, top left on the main screen). Tap Text Recognition (OCR), then tap Automatic Recognition, then pick the languages you want it to scan for. Only switch on the ones you’ll actually use regularly, otherwise you may slow things down as the app tries to figure out which language to use. I have German and English, for fairly obvious reasons. When OCR is switched on, Scanner Pro will automatically convert any scans to text, if it can. You can always display the image as text to see how well it did (above). In text view, you can also copy snippets, or the whole thing, to the clipboard. For any serious work, you might consider exporting to the PDF app of your choice. Scans can be shared as PDFs or JPGs. PDFs keep the recognized text layer, whereas JPGs don’t. The app’s custom share sheet can send straight to Dropbox, Evernote, and others, as well as print and fax. Yes, fax. In 2017. It’ll cost you money (the price depends on country, and so on, and is shown before you send the fax), but it avoids a trip to… well, it avoids a trip to wherever they still have faxes. 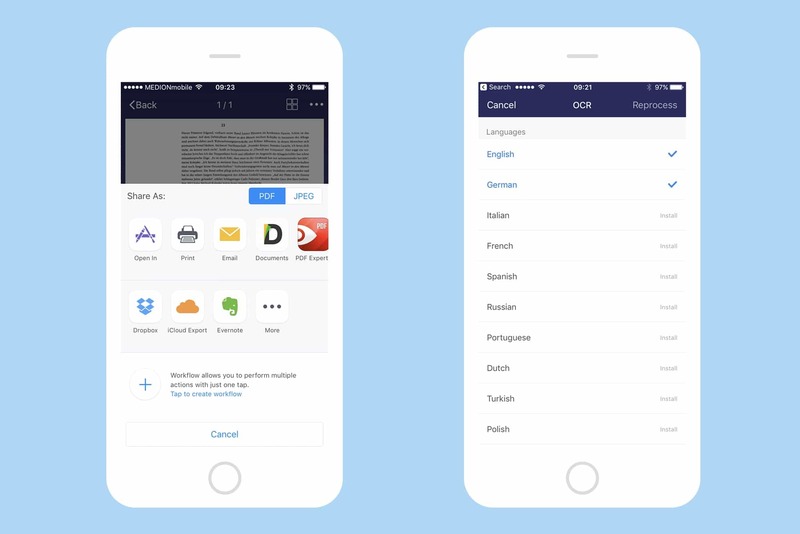 Sharing is easy, and text recognition can manage most languages. You can also create customs “workflows.” These are presets to share documents to your choice of service. You can save to a particular Evernote note, for example, or send the scans in a custom mail template. I don’t bother. I just switch on iCloud Drive in the app’s settings, and let it save all my scans there. That way, I can access them from any app, and from my Mac. It also lets me find anything I’ve scanned with a simple Spotlight search, and I never have to manually save anything. If you’ve been taking regular photos of your paper scraps until now, then you can still turn them into scans. To do this in Scanner Pro, you just need to hit the little radar icon at the top of the main screen. This scans your photos and picks out any it thinks may be papers, or other eligible subjects. Go ahead and tap any you want to import. It works just like with freshly-scanned images. One thing to note it that it will combine all selected images into one multi-page document, which means multiple visits to import lots of documents. Still, it’s a pretty great feature. Scanner Pro can find and process images you already have in your camera roll. That’s it. 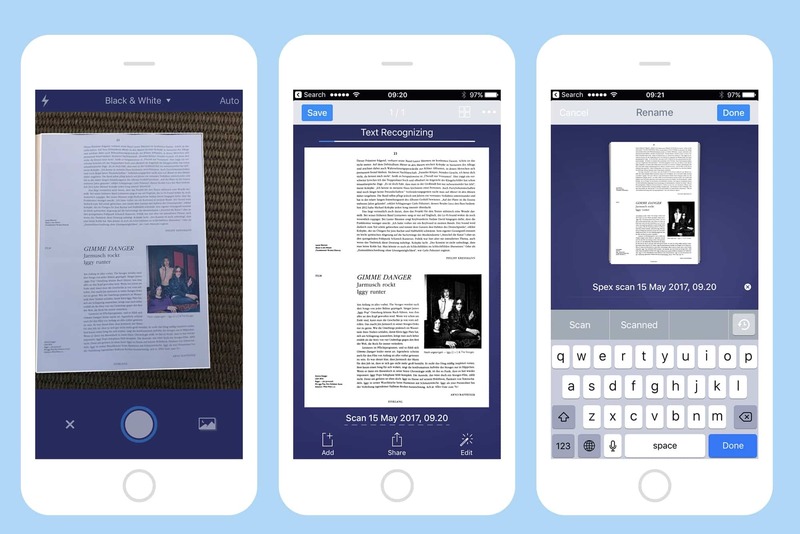 Now you can keep scans out of your camera roll, all in one place, and you can easily find them again, even if you can only remember one or two words from the scanned document itself. Give it a try. It might not seem that useful as you’re doing it, but in the future, when you’re trying to find something important, you will be super-duper pleased that you made this (trivial) effort.